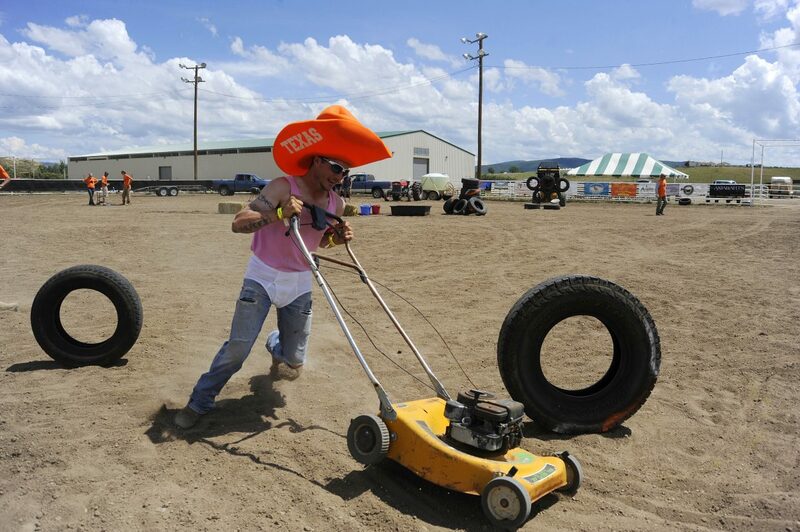 Sean Bailey pushes a lawn mower during the 2013 Routt County Redneck Olympics at the Routt County Fairgrounds in Hayden. Steamboat Springs — After receiving a threatening letter, organizers of the Redneck Olympics in Hayden need to come up with a new name for the third annual event to held July 12. Shortly after last year’s event, organizers received a letter stating the International Olympic Committee, or IOC, did not want them using the word Olympics. “It was a serious letter for our not-so-serious event,” co-organizer Travis Mathey said. The organizers met and Mathey said everyone had a different opinion about what they should do. “We started weighing the possible repercussions and said it’s probably worth just changing the name,” Mathey said. Organizers were somewhat honored that the event was recognized by the IOC. “Now that we are on the IOC’s radar, we feel confirmed in our assessment that we have hit the big time,” co-organizer Wendy Lind said. The event, which includes mud surfing, a lawn mower race and steeplechase events, gained fame last year when a story was written in the Denver Post. The games are held at the Routt County Fairgrounds. “Our goal this year is to maintain the events that seem very successful and fully improve all of them,” Mathey said. Organizers have started a contest for people to choose the event’s new name. The deadline is May 1, and people can submit their suggestions on the event’s Facebook page at http://www.facebook.com/rcredneckolympics. Suggestions for a new name so far include the Routt County Redneck Olymphicks, The Event Formerly Known as Redneck Olympics and HMBWT (hold my beer, watch this). Proceeds from the event go to the Routt County Agricultural, Youth & Heritage Foundation. The foundation supports the Routt County Fairgrounds and its programs. Organizers still are looking for sponsors for the event, which this year will feature two bands from Nashville, Tenn.
More information about the event can be found at http://www.rcrednecks.com.